What if Superman had crash-landed in the U.S.S.R.? 12-inch tall Real Action Heroes action figure. Based on DC Comics' Superman: Red Son. Includes additional muscles, interchangeable hands, and a display stand! Based on DC Comics' 2003 Superman: Red Son by Mark Millar and Dave Johnson, here's Medicom's Real Action Heroes version of what the Man of Steel might have been like had he crash-landed in the U.S.S.R. instead of the USA as a baby. 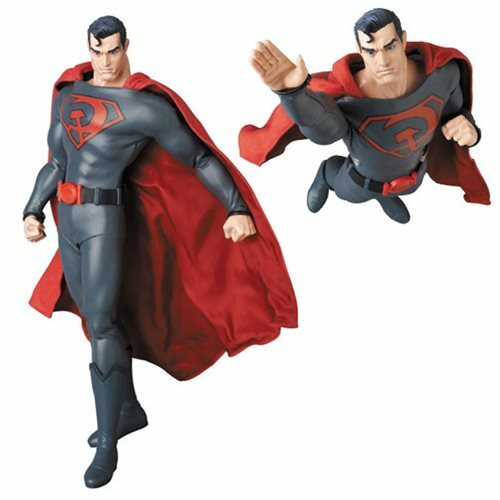 The DC Superman Red Son Real Action Heroes 1:6 Scale Figure measures approximately 12-inches tall and includes additional muscles on the RAH 301 Kai body, interchangeable hands, and a display stand. Ages 15 and up.